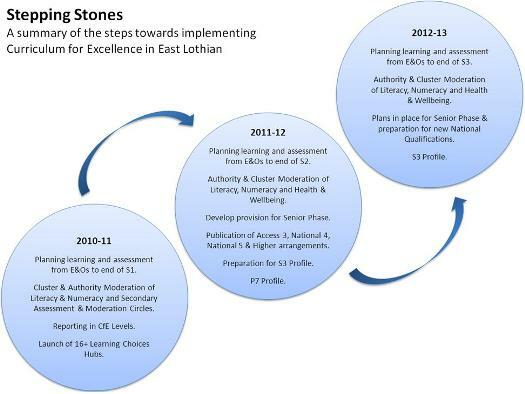 The CfE in East Lothian Planning Ahead document for next session has now been completed and sent out to schools. The teachers of schools in the Haddington cluster came together on the afternoon of the 10th January to share their progress with planning and assessment. The afternoon involved a brief input from me, followed by three teachers from primary and secondary sharing their practice. Everyone then worked in mixed groups to share an summarise what was working well for them and what were the common issues. They then displayed these and had a chance to look at each others and provide feedback. The session concluded with teachers coming together as departments/faculties/schools to consider their approaches to planning and assessment. You can view the presentations and outcomes from the afternoon below. How do we plan with Curriculum for Excellence? Many teachers and other practitioners involved in the education of young people in Scotland are currently giving a lot of thought to how best to plan their lessons. It is important to stress that Curriculum for Excellence does not intend to dramatically increase the volume or complexity of planning learning. As can be seen from the ‘Wordle’ of Building the Curriculum 3 above, the focus of the curriculum is on young people’s learning. Although there is no set planning format as such associated with Curriculum for Excellence, there are a number of principles which one would expect to see applied in classrooms and should therefore be evident in the planning. Which specific experiences and outcomes, or parts of experiences and outcomes, will the young people be learning? These could be bundles of curricular and literacy, numeracy and/or health & wellbeing. What content will be learnt? How will you and the young people know what that they have learned and how well they have learned it? What opportunities are there for interdisciplinary learning? What is the relevance? How does this relate to life? What opportunities will the young people have in shaping what they learn, how they learn and how they will be assessed? “At its most basic, learner engagement requires teachers to share learning intentions and indicate what would constitute good measures of success. Learners also need to receive early and accurate feedback and should be given the opportunity to discuss the teacher’s assessments and their implications for future progress. So perhaps it is worth considering the extent to which your current planning allows for genuine pupil involvement in the processes of learning, teaching and assessment and when they make the learning relevant to their lives. You can download this post as a word document by clicking here.